(Nanowerk News) Professor Shin-Hyun Kim and his research team in the Department of Chemical and Biomolecular Engineering at Korea Advanced Institute of Science and Technology (KAIST) have developed a novel photolithographic technology enabling control over the functional shapes of micropatterns using oxygen diffusion. The research was published online in the March 13th issue of Nature Communications ("Dynamic designing of microstructures by chemical gradient-mediated growth") and was selected as a featured image for the journal. Polymers with various shapes and sizes produced with the new photolithographic technology developed by Professor Kim. Photolithography is a standard optical process for transferring micropatterns on to a substrate by exposing specific regions of the photoresist layer to ultraviolet (UV) light. It is used widely throughout industries that require micropatterns, especially in the semiconductor manufacturing industry. Conventional photolithography relied on photomasks which protected certain regions of the substrate from the input UV light. Areas covered by the photomasks remain intact with the base layer while the areas exposed to the UV light are washed away, thus creating a micropattern. This technology was limited to a two-dimensional, disc-shaped design as the boundaries between the exposed and roofed regions are always in a parallel arrangement with the direction of the light. Professor Kim’s research team discovered that: 1) the areas exposed to UV light lowered the concentration of oxygen and thus resulted in oxygen diffusion; and 2) manipulation of the diffusion speed and direction allowed control of the growth, shape and size of the polymers. 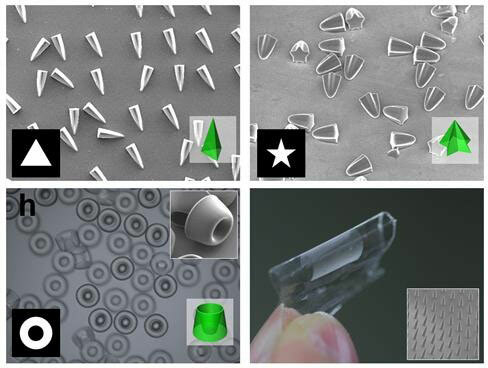 Based on these findings, the team developed a new photolithographic technology that enabled the production of micropatterns with three-dimensional structures in various shapes and sizes. Oxygen was considered an inhibitor during photopolymerization. Photoresist under UV light creates radicals which initialize a chemical reaction. These radicals are eliminated with the presence of oxygen and thus prevents the reaction. This suggests that the photoresist must be exposed to UV light for an extended time to completely remove oxygen for a chemical reaction to begin. The research team, however, exploited the presence of oxygen. While the region affected by the UV light lowered oxygen concentration, the concentration in the untouched region remained unchanged. This difference in the concentrations caused a diffusion of oxygen to the region under UV light. When the speed of the oxygen flow is slow, the diffusion occurs in parallel with the direction of the UV light. When fast, the diffusion process develops horizontally, outward from the area affected by the UV light. Professor Kim and his team proved this phenomenon both empirically and theoretically. Furthermore, by injecting an external oxygen source, the team was able to manipulate diffusion strength and direction, and thus control the shape and size of the polymer. The use of the polymerization inhibitors enabled and facilitated the fabrication of complex, three-dimensional micropatterns. Professor Kim said, “While 3D printing is considered an innovative manufacturing technology, it cannot be used for mass-production of microscopic products. The new photolithographic technology will have a broad impact on both the academia and industry especially because existing, conventional photolithographic equipment can be used for the development of more complex micropatterns.” His newest technology will enhance the manufacturing process of three-dimensional polymers which were considered difficult to be commercialized. The research was also dedicated to the late Professor Seung-Man Yang of the Department of Chemical and Biomolecular Engineering at KAIST. He was considered one of the greatest scholars in Korea in the field of hydrodynamics and colloids.